Interview with, Professor Fernand de Varennes, one of the world’s most famous experts in defending human rights, conducted by Liudvikas Jakavičius-Grimalauskas, and presented in cooperation with the European Foundation of Human Rights (EFHR). The UN General Assembly proclaimed 10 December as Human Rights Day in 1950, to bring to the attention of the peoples of the world the Universal Declaration of Human Rights as the common standard of achievement for all peoples and all nations. To commemorate this important day, the EFHR organized several events related with Human Rights during all the month of December. 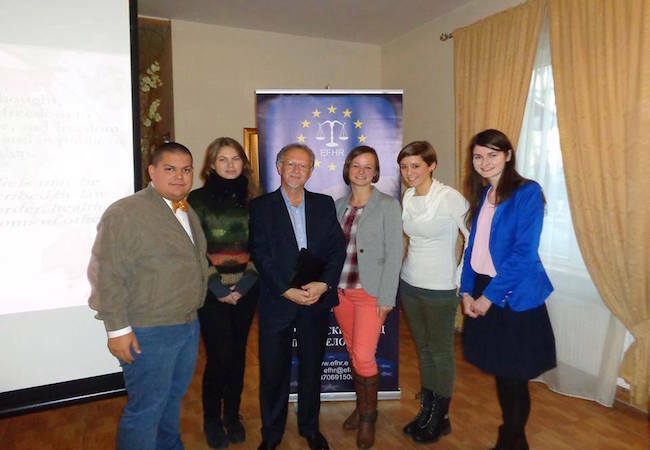 On December 3, 2014 the EFHR had the honor to host the training seminar “How to Balance National Law and International Law: Theory and Practice”. This seminar was chaired by Professor Fernand de Varennes, PhD specialized Laws and Human Rights. During the convention participants have discussed practical issues of applying international law in domestic legal systems. Analyzing tensions between those two systems, Professor Fernand de Varennes mainly focused on human rights and their implications on national law. He has also explained the nature of relation between democracy and human rights. The activity of EFHR was presented, too. The training sparked a huge interest. Among around 80 participants there were representatives of top state legal institutions: Supreme Court of Lithuania, The District Court of Vilnius Region, Vilnius City District Court, Ministry of Justice as well as other lawyers, members of different NGOs and students. During this event, Jakavičius-Grimalauskas, have had the opportunity to interview Professor Fernand de Varennes. But, who is Professor Fernand de Varennes? Dr Fernand de Varennes – obtained a law degree (LL.B.) in Canada by the University of Moncton and a Master´s degree in law (LL.M.) from the London School of Economics and Political Science in the United Kingdom. In 1996, he obtained his PhD in law (Dr Juris) from Maastricht University in the Netherlands. Dr de Varennes founded, among others, the first human rights LL.M. in Australia and is a well known expert on minority and human rights. He has taught students in Europe, Asia, North America and Australia. He has been on the advisory board of many scientific law journals and research centres, and has written over 150 articles and books which have appeared in about 30 languages. Liudvikas JAKAVIČIUS-GRIMALAUSKAS: What are Human Rights for you? Why you decided to devote your life to Human Rights? PROFESSOR Fernand DE VARENNES: Human rights are a moral code with a series of limits on the power of the state to try to ensure a balance in how a state can treat individuals who are at its mercy. This balance is based that as individuals we are all entitled to minimal forms of respect for the characteristics, needs and interests of all human beings. As a humanistic, human rights are therefore a direct extension of my own personal beliefs. It was therefore natural for me to gravitate towards human rights in my work and research as a university academic. J-G: What do you consider to be the main problem in current democracies in regards to Human Rights? PROFESSOR Fernand DE VARENNES: Implementation – particularly when it comes to the exercise of human rights by the more vulnerable segments of society such as indigenous peoples, minorities, women and immigrants. While the “idea” of human rights was accepted as part of international law after the Second World War – not very long ago in historical terms – the mechanisms to apply international human rights law are still very weak – and in many cases do not really exist. We therefore have the unfortunate situation that the tools to legally protect the weakest members of society against their own governments have still not been developped fully. J-G: What is the most difficulty in reconciling national and international law? PROFESSOR Fernand DE VARENNES: Despite the rhetoric, it is not true that all governments will apply international law – especially international human rights law – in their own legal systems. This means you sometimes have legal obligations under a treaty in international law, such as in the case of the Framework Convention on the Protection of National Minorities – and almost no way of directly enforcing these obligations. J-G: Why some human rights violations remain outside political concerns? PROFESSOR Fernand DE VARENNES: Most governments often find it difficult to admit their systems have failed, or that their civil servants are at fault when it comes to human rights violations. It is often simpler or easier to deny or ignore problems unless they become highly visible or intolerable. In addition, it must be admitted that in some countries not everyone is deemed to be as worthy of protection or consideration as others. Minorities and others are often frequently more susceptible to ill-treatment than others. Since they are a minority, they are not necessarily high on the scale of political concerns for those who want to obtain the electoral support of the majority. J-G: How can EU mechanisms promote human rights? PROFESSOR Fernand DE VARENNES: The European Union is not a human rights organisation – it is first and foremost an economic and political union. I think it is naive to bellieve it has a great deal of interest in human rights. It has a Charter of human rights – but which only affects the institutions of the EU – not the practice by states. J-G: Which are Lithuania´s strengths and weaknesses in Human Rights? PROFESSOR Fernand DE VARENNES: Lithuania has to deal with challenges in a number of areas: the threat of hate speech through social media and broadcasting is not addressed strongly and consistently by the institutions of the state, including its police and prosecution services. The attitude towards minorities in the country is among the least consistent with European and international standards in European countries – there is unfortunately a tendency to follow the examples of Latvia and Estonia in this matter which are generally considered not to be good models. I think human rights promotion and general among the civil service in general and the judiciary needs to be highlighted by the government itself a lot more – with a focus on the rights of vulnerable groups such as the Roma, minorities and women. J-G: How would you evaluate the role of the UN in regards to the promotion and fulfillment of human rights? PROFESSOR Fernand DE VARENNES: That is the main function of the UN: the promotion of human rights. I think it does what it can with very limited resources. People would be amazed at how little funding the UN actually has for this purpose. Unfortunately, the UN mechanisms for the actual implementation of human rights are extremely weak – hopefully there will be a drive sometime in the future to correct this weakness. J-G: Do you believe that is possible to achieve a world with a full fulfillment of Human Rights? PROFESSOR Fernand DE VARENNES: Respect for human rights should be considered as an objective which can never completely be achieved, since societies and teh world itself are always changing and thus create new human rights challenges all the time. But they do represent a vision of a better world, and it is only by striving for better can we improve our own world in the present. This interview was conducted by Liudvikas Jakavičius-Grimalauskas in cooperation with the European Foundation of Human Rights. The European Foundation of Human Rights (EFHR) is an organization (NGO) actively operating in Lithuania since 2010. It was established in response to the striking increase of the abuses of human and national minority rights in Lithuania observed after joining the European Union. Jakavičius-Grimalauskas is a Lithuanian columnist specialized in politics and the current Head of Media Relations for H.S.H. Prince Inigo von Urach. He is also working at Šiaulių Didždvario gimnazija (Radijo klubas 89.7 FM) through the Erasmus + (EVS) programme from the EU. The attendance to the conference “How to Balance National Law and International Law: Theory and Practice” was one of the activites sponsored by Šiaulių Didždvario gimnazija for the project “Be Radio-Active”. This article was originally written for DELFI English (by The Lithuania Tribune), the largest online portal in the Baltic States.